It has been raining here in Los Angeles and we are loving every second. Nothing is more soothing than falling asleep to the sound of drops hitting our rooftop, then waking up to find the plants outside glowing a brilliant green and radiating with life. These cloudy days are perfect for photographing food: the light is softer, diffused, and bluish-white, making everything more vibrant and a pleasure to shoot. Speaking of photography, our friend Soe (Lime & Cilantro), an outstanding cook and photographer (won “Best New Voice” at the Saveur 2016 Blog Awards), recently invited us to participate in a #noodleholicsparty where everyone cooks their favorite noodle dish and shares it today on their website. With a hashtag like that, how could we resist? This spicy and comforting delicacy couldn’t be more fitting for a cold rainy day. It is one of our favorite Korean appetizers, and this vegetarian version is just as flavorful as the original. 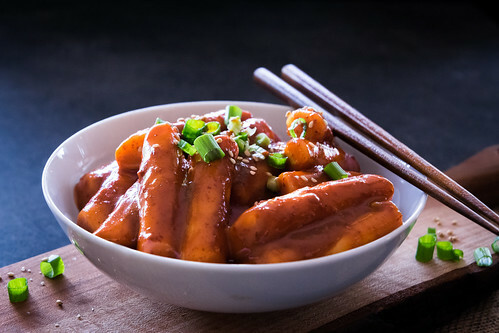 A fun word to say, tteokbokki (duck-boke-KEE) is also super quick and easy to make! If you like a little heat, this recipe can’t be beat! 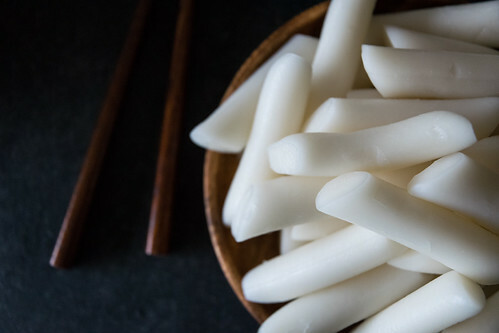 Thick Korean tube-shaped rice noodles are simmered in a spicy red sauce guaranteed to warm you up on a chilly night. 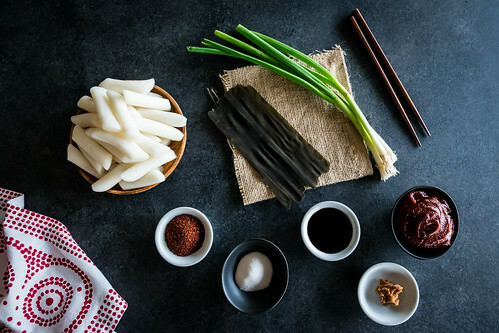 Simply prepared with red chili paste, gochugaru powder, fresh scallions, and a touch of sugar, this popular dish typically starts with an anchovy-based broth, but we came up with a delicious and vegetarian-friendly alternative that is just as tasty. Made with red miso, soy sauce, and kombu kelp, this was a perfect replacement for the traditional fish stock. With ultra chewy noodles, similar to the texture of mochi, the bold flavors and fiery kick of the sauce make this a warm and satisfying wintertime snack, and an ideal appetizer to spice up your next dinner party. This one-pot dish takes less than 30 minutes to make. You just heat some broth in a skillet, stir in the other ingredients, then let it simmer until the noodles are tender and the sauce is thick and bubbly. That’s it: simple, easy, and delicious! 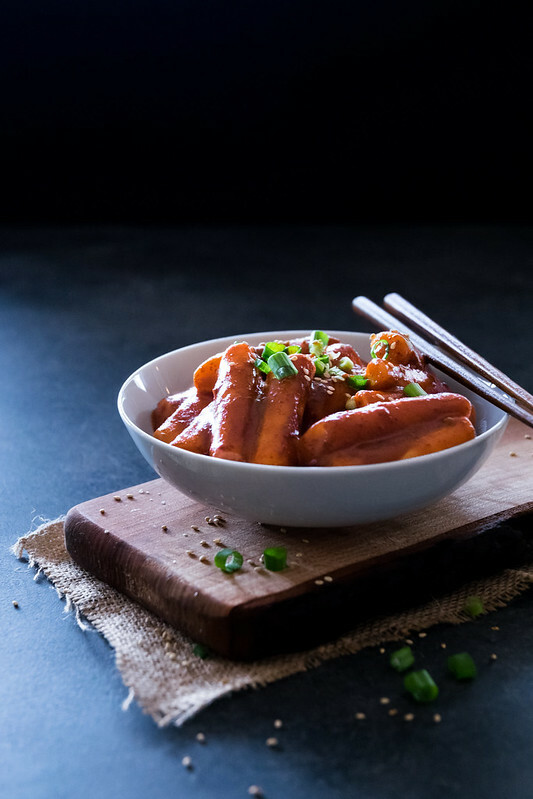 We have been enjoying tteokbokki for years, and look forward to it every time we visit our favorite Korean restaurant, so we’re absolutely thrilled to finally make it at home and to share the recipe here! Thanks again to Soe for hosting this #noodleholicsparty! We love seeing everyone’s creative recipes, so be sure to check out the other talented bloggers below, and let’s get this noodle party started! Place the kelp in a large deep skillet and pour over the water. Add the miso paste and soy sauce, and stir gently to combine. Place over medium-high heat, and bring to a boil. Boil uncovered for 15 minutes. 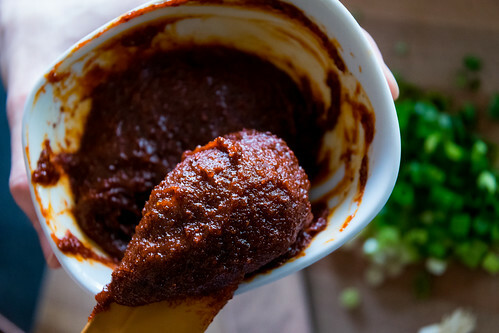 Meanwhile, in a small bowl combine the gochujang paste, gochugaru powder, and sugar, and stir until smooth and combined. When the 15 minutes are up, remove the kombu and discard or keep for another use. Add the noodles, the chili paste mixture, the scallions, then stir to combine and dissolve the paste. Bring to a boil and cook at a high simmer, stirring often to prevent sticking, until the noodles have softened and the sauce has thickened, 12 to 18 minutes. 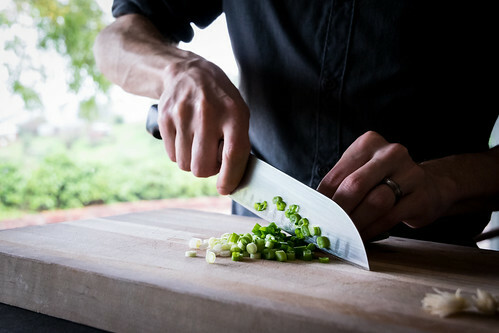 Serve warm, topped with sliced scallions for garnish. — Kombu seaweed and miso paste are available in many grocery stores, and both are available online. 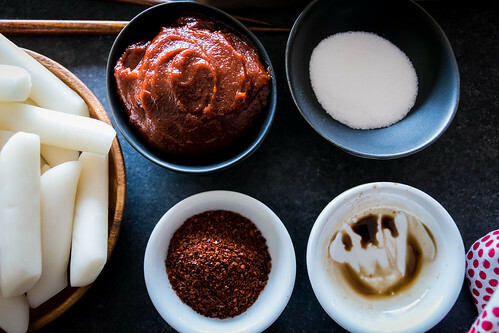 The gochujang paste (Korean red chili paste), gochugaru powder (Korean red chili powder), and thick rice noodles will be available at stores that cater specifically to a Korean clientele, or online. We tried them the first time a few years ago at a Korean restaurant, and immediately fell in love! They’re so different from any other noodles we’ve tried! When I saw the dish, I didn’t know that was noodles. Now, I want to try those because I’m a big fan of noodles. Thanks so much Carlos! 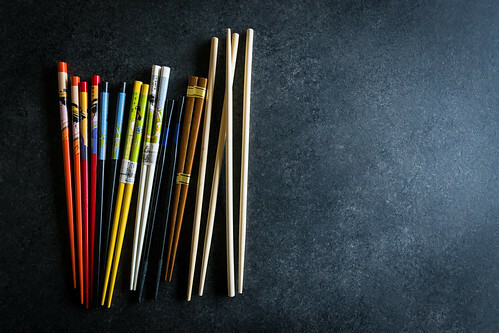 Any noodle fan will love these! Thanks so much Joanne! It’s easy to write about a dish when you love it so much! I love rainy days too and glad that we have been getting some rain in the past few weeks! Noodles, especially with some spice and heat, are perfect for the weather, don’t you think? Can’t wait to try this! Yes, this rain has been sooo nice! Everything is so green and lush now! Perfect soup weather, and your pumpkin laksa sounds delicious! Hi! Thought I’d add a review since I actually made the dish. I Found your anchovy-free recipe and made it this afternoon as a snack. It was delicious! I added some sesame seeds on too and it was perfect. I will probably lay off of the red pepper flakes a tiny but next time as it was a little too much for us — still inhaled it tho! Thanks so much for the recipe. That’s so cool to hear, thanks for letting us know! Glad you liked it as much as we did! And yeah, you could definitely cut down the amount of pepper flakes to get it just how you like it! Hi, I was wondering if I could use vegetable broth or mushroom broth instead of the kombu kelp since I can’t find any where I live. Hi Lina! Yes, either of those would work! 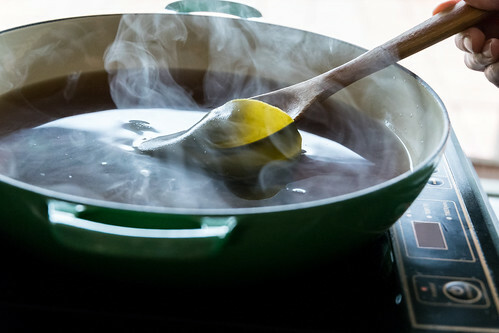 Since the kombu isn’t very strongly-flavored, try using a mixture of half broth and half water, so it’s not too salty or overpowering. Hope you enjoy it!